Numerous farmland surveys (Iowa State, KC Fed, Chicago Fed, Purdue) now seem to be clearly indicating what many had expected for some time, farmland values are heading lower. This is not surprising given how sharply farm incomes have fallen. As we pointed out last year, the declines in income have pushed the rate of return to owner operated farmland very low. Given that both cash rents and farmland values have started to decline, we thought that it would be interesting to examine these values and the current level of farmland capitalization rates on farmland. According to USDA cropland values fell by 2% in Indiana, 4% in Nebraska and 7% in Iowa. These declines come after a truly remarkable run-up. 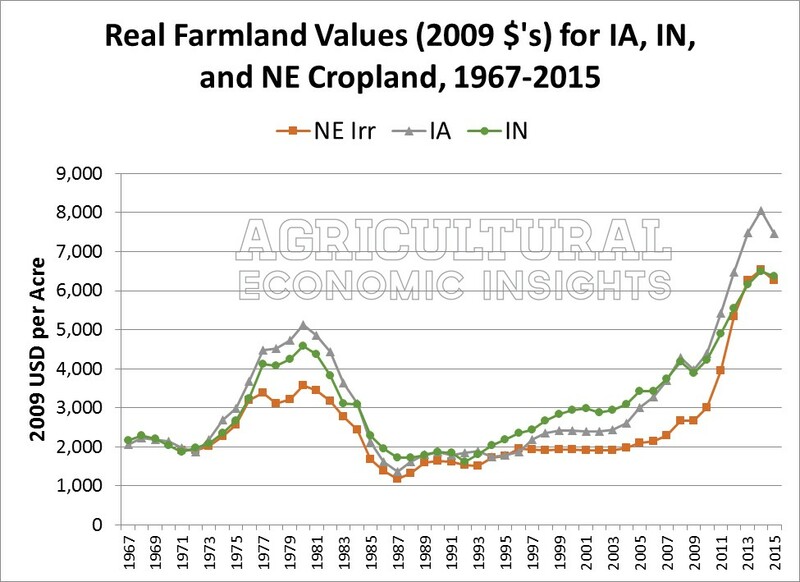 In Figure 1, real land values are shown for Iowa, Indiana, and Nebraska (irrigated) from 1967 to 2015. From 2000 to 2015 real farmland values in Iowa increased by 210% for an annual real rate of increase of 8%. The gains were similar in Nebraska while Indiana “only” increased by 118% (again in real terms). What is more interesting is that much of the gain came recently. In spite of the most recent decline, from 2010 to 2015 real values increased at an annual rates of 11% in Iowa, 9% in Indiana, and 16% in Nebraska. Figure 1. Real (2009) Values for Nebraska Irrigated, Iowa, and Indiana Cropland. Source: USDA/NASS. Deflated with GDP Chain-Type Price Index. As farm incomes shot higher, rents followed. The USDA’s estimate of average real (2009 USD) cash rental rates for Iowa, Indiana, and Nebraska are shown in Figure 2. As with cropland values it is important to keep in mind that these are estimates of the average rental rate across the whole state and one should expect significant variations within the states. Figure 2. Real (2009) Cash Rental Rates for Nebraska Irrigated, Iowa, and Indiana Cropland. Source: USDA/NASS. Deflated with GDP Chain-Type Price Index. 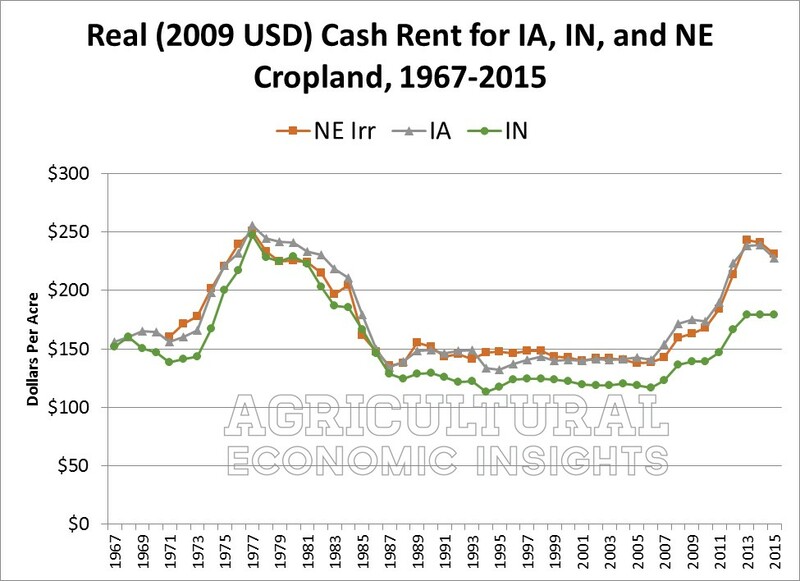 As one would expect cash rental rates follow a similar pattern as cropland values. Both show large peaks in the previous boom period of the late 1970’s followed by a sharp drop in the 1980’s. They then remained relatively flat for a number of years before rising again in the most recent boom period. Today, they are starting to decline. It is important to note that it is income, not land values that drives cash rental rates. In other words, the rental rates and land values rise and fall because of changes to the earning potential of farming. As that rose in the boom period both rates and farmland values increased. As earnings potential declines rates and land values tend to follow. Keep in mind that these are moving targets as it is really expectations of income potential that work to change the values. Often expectations are slow to adjust to rapidly changing conditions. After several years of lower earnings it appears that expectations and thus rents are starting to fall. The movement of cash rental rates and farmland values is not perfectly correlated. The peak in real cash rents occurred in 1977, while farmland values climbed higher for a few more years. Another interesting feature of the real cash rent values is that they have just barely reached the real levels seen in 1977 while real farmland values have climbed past the previous highs. While rents and land values are both driven by expectations of farm earnings, land values arguably react to an even broader set of criteria such as interest and inflation rates. Further, farmland values capture expectations for many future years of earnings while rents are clearly based on more short term concerns. That said, there are many possible explanations but one must not underestimate the turmoil caused by high rates of inflation and rapid changes in interest rates. Both cropland values and cash rental rates have also started to decline. Perhaps the most common measure of the relative price of farmland is the ratio of cash rent to farmland values, commonly referred to as the capitalization ratio. This ratio is expressed as a percentage and indicates the current gross (not including property taxes or other ownership costs) rate of return on a piece of farmland purchased at today’s prevailing prices. Based on USDA’s estimates of cropland values and cash rental rates, it is possible to estimate capitalization rates. Again, the caveat about this being aggregated and average across an entire state applies. However, we think that the averages provide a good indication of the general trend of capitalization rates in these areas. Figure 3 shows the capitalization rates for Iowa, Indiana, and Nebraska irrigated cropland. The figure also includes the average rate on the 10 year U.S. Treasury bond (shown in blue). As one can see capitalization rates continue to set new lows. This means that the level of earnings relative to cropland values is very low. Or said another way, buyers continue to pay a lot for each dollar of current earnings of farmland. Figure 3. 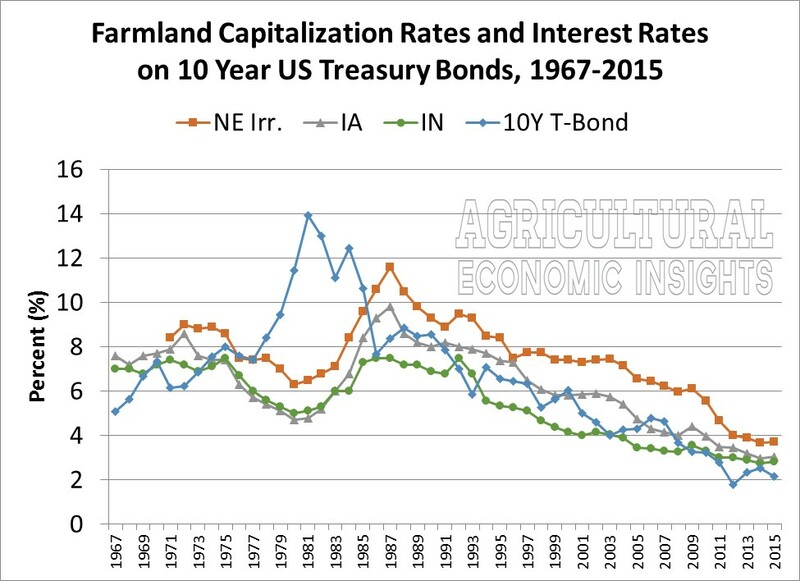 Farmland Capitalization Rates and Interest Rates on the 10-Year U.S. Treasury Bond, 1967-2015. Source: USDA/NASS, St. Louis Federal Reserve Bank. There are several reasons that buyers might do this. First, they might expect that the downturn in income (and cash rents) may not persist. If earnings and rents were to rise it would increase the capitalization rate. Finding equilibrium in these markets takes time. Earnings expectations do not change overnight. Second, the opportunity cost or alternatives investment choices also likely have low rates of return. This is illustrated with the interest rate on the 10-year Treasury bond. This value too is very low, so it is not unreasonable that capitalization rates on farmland would be low. In other words, investor’s opportunities to achieve higher rates of return are limited so they continue to pay high prices for farmland earnings. Until interest rates increase it is likely that the low capitalization rates will persist. Further, while capitalization rates tend to follow the general trend in longer-term interest rates, one can see that they sometimes diverge such as in the 1980s. In that case, the less liquid farmland market had a hard time adjusting to the rapid move in interest rates. However, within a period of 4 years or so farmland capitalization rates were trending in similar directions as longer-term interest rates. Both farmland and cash rental rates are now starting to trend lower. These trends bear close attention. Farmland values are a critical store of wealth in the U.S. farm sector. Cash rents are one of the largest expense categories for farmers. As revenue potential declines, persistently high cash rental rates have been a major contributor to the profitability and cash flow squeeze. It appears that they are now begging to react to this squeeze. As has been the case for some time, capitalization rates on farmland are quite low. These low rates mean that farmland purchases are paying a high price for current earnings. This is not surprising given the very low rates of return offered on many other longer term assets such as Treasury bonds. The relatively stability in longer-term interest rates have probably helped add some stability to the farmland market. However it is important to remember that changes in longer-term interest rates would likely have a bigger impact on farmland values than rents. For this reason, it is critical to keep a close eye on longer term interest rates as well as farm earnings.